"HOW LONG BEFORE YOU'RE A VETERAN? HOW LONG BEFORE YOU'RE IN YOUR PRIME? AND WHAT DO YOU DO IF THE TWO MEET? YOU'D HAVE WAR OF AGES, WHOSE LATEST ALBUM, ‘SUPREME CHAOS,'DOMINATES." -HM MagazineWar of Ages has a long standing tradition of delivering relatable metal music for fans of all ages. They've been releasing heavy music with raw power since the band's conception. Their impressive discography includes six studio albums equating to over 100,000 album sales with the 3 latest albums hitting the top 200 billboards. War of ages has toured extensively with bands such as As I Lay Dying, Soilwork, Throwdown, Demon Hunter, Underoath, Unearth, Between The Buried And Me, and many more.Leroy Hamp and Steve Brown began War of Ages in 2003, adding drummer Alex Hamp soon after. They have continued to be the backbone of War of Ages for the past 10 plus years. Since then the band has toured rigorously all over the world and stayed consistently busy. After adding guitarist Jack Daniels (Hope for the Dying) into the mix in 2013, the band re-emerged with a vengeance and animproved writing stye.War of Ages' latest release "Supreme Chaos" (2014) has succeeded in impressing old fans and acquiring more by venturing into a new style of writing while incorporating some of their tried and true elements. Recorded with Josh Barber at Covenant Studios (Norma Jean, EISM) and mixed by Will Putney (Impending Doom, For Today), it would seem that "Supreme Chaos" got the royal treatment from some of the finest sound engineers in the business. Steve delivered his ever impressive guitar solos, and Jack succeeded in bringing even more texture, dynamics and shredding than ever before. Thus resulting in ablend of technical, engaging melodies you can't help but move your head to.Leroy used his traditional method of writing each song the day before it was recorded by which he was able to create a real flow of lyrics in relation to the music written by the other band members. The lyrics found on Supreme Chaos are often raw, taken from real life experiences. With themes such as family, role models, and self worth, "Supreme Chaos" gives War of Ages the ability to meettheir fans where they are, making them a much- needed relatable band.Singer Leroy and his brother Alex (drummer) certainly know about rising from pain. In their life experience, they have dealt with kidnapping, abuse both physical and mental, and the confusion that surrounded their family and their backward beliefs. Instead of following the same path, the brothers along with guitarists Jack and Steve have created a life around reaching those who are hurt and broken. 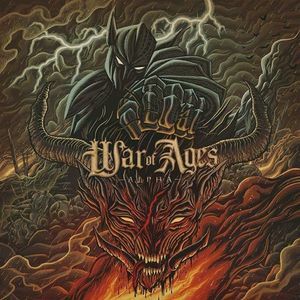 War of Ages is in the unique position to be able to tour with a varietyof bands, play a variety of festivals, and become friends with people from many walks of life while bringing with them an element of grace and truth.The theme of what it means to be a warrior and a hero is ever present throughout War of Ages six albums. Integrity is something that the band as a whole strives for daily. War of Ages has proven that they can stand strong and confident as a band and as a staple in the music scene "You want to survive in this world? Accountability. Especially in a band environment." said Leroy in a recent interview with HM Magazine. This knowledge and drive has kept War of Ages afloat in an industry where a majority of artists sink amidst a sea of ego's andunfortunate choices.Above all, War of Ages has developed a huge appreciation and sense of humility for the career they are blessed to have. Whether playing for a crowd of ten thousand or a crowd of one hundred, they deliver the same solid show with the same high energy. They strive to maintain their sense of real-ness with their fans while at the same time providing for and being a role model for their families. With future albums, fans can expect more creative growth and hard hitting music. A forced to be reckoned with, War of Ages expects to remain a solid fixture in themetal music spotlight.